Rohit had returned to India from Australia for a week or so after Samaira’s birth. Rohit Sharma generally has luck going in his favour as a captain but in the just concluded T20I series, he saw an exception as India went down to New Zealand by just four runs in the deciding game to lose the series 1-2. It must have been a disappointing moment for the stand-in captain who guided India to quite a few titles of late but once he returned home, it didn’t take much longer for the mood to change. 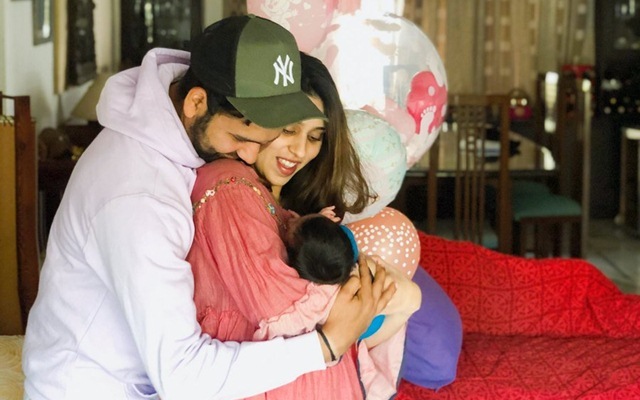 The 31-year-old cricketer, who has also been in good touch with the bat of late, found time to spend with his baby daughter Samaira born in December end. A video of the cricketer dad playing with his girl was also shared on Twitter. Rohit’s wife Ritika Sajdeh had also shared pictures of their baby ‘cheering up’ her father, while he played in Australia, on social media though her face was not revealed. Rohit had returned to India from Australia for a week or so after Samaira’s birth and missed the fourth Test match in Sydney. He joined the Indian squad for the ODI series in January and belted a big hundred in the very first game at the SCG though India lost it. He then played in all the games in Australia and New Zealand and also captained the side in New Zealand in the absence of regular skipper Virat Kohli who went to a break. Rohit led in two ODIs, winning one and losing one and three T20Is, winning one and losing two. The loss in the T20I series saw Rohit missing out on bettering Kohli’s captaincy record in the shortest format. He now has 12 wins as the captain in the 20-over variant which is equal to Kohli’s numbers though the former lost only three games as against the latter’s seven. India will play two T20Is and five ODIs against Australia at home starting February 24 and it is likely that Rohit could be rested for some matches to re-energise his batteries ahead of the Indian Premier League (IPL) and ICC World Cup, scheduled to start on May 30.